Sunday was Groundhog Day and the Superbowl! The second upset happened on the football field. Nowhere is football more revered than in the South, unless of course it is Superbowl Sunday when all of America becomes a fan. I did not have a dog in the hunt – or a team in the game – but did not let that stand in the way of throwing a party. We were divided in our allegiance to the two teams which kept things interesting, at least for the first few minutes before the game became a runaway train wreck. The rest of the game we entertained ourselves with Superbowl Bingo, Orange Crush, Wolf Brand Chili, chocolate chip cookies, and Blue Bell Ice Cream (Homemade Vanilla, of course). I missed most of the plays as I was collecting new words for next year’s Bingo game. Gotta plan ahead! If the snow lets up this week, I will make my way to the local stores to see what Superbowl items I might find in the clearance racks for 2015. That’s where I found the referee “shirts” last year. Woo Hoo! 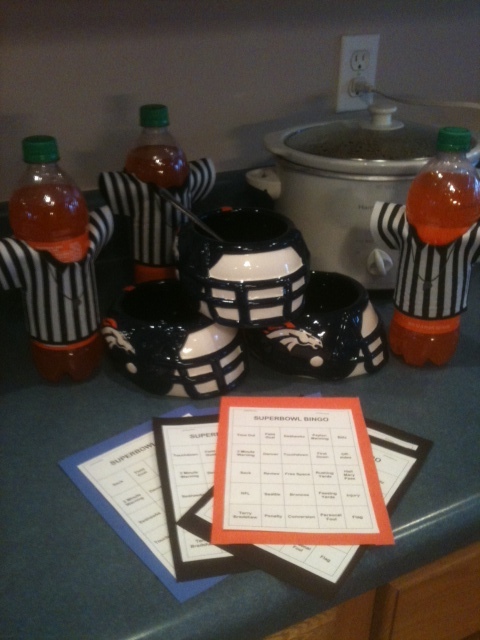 Denver Bronco “helmets”, Orange Crush “Referees”, and Superbowl Bingo! This entry was posted in Southern Celebrations and tagged Broncos, Football, Groundhog Day, Punxsutawney Phil, Referee, Superbowl. Bookmark the permalink. 1 Response to Groundhog Day Upset! Too cute, sounds like a fun day and chili is always a winner on a cold day!